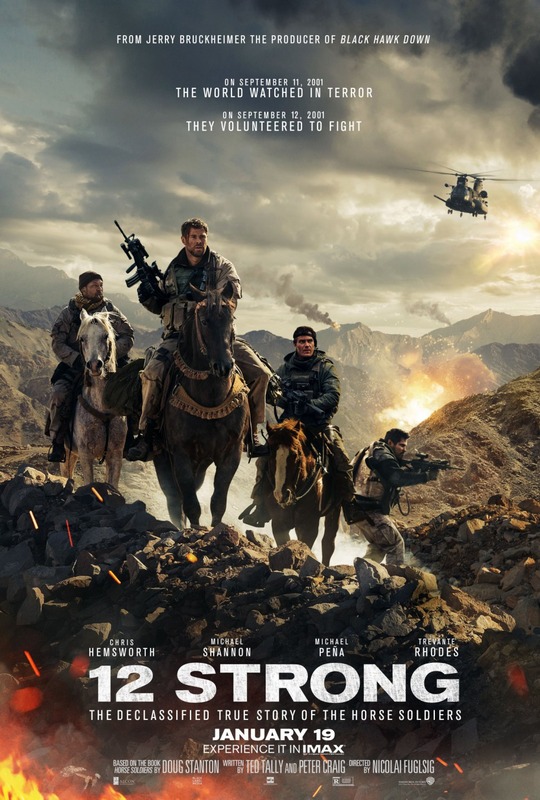 "12 Strong" tells the stirring story of a dozen special forces soldiers, who volunteered to travel to Afghanistan in the days following 9/11 to help a local warlord fight the Taliban. Chris Hemsworth (best known as Thor) leads the group, which includes actor Michael Shannon, playing a nice guy for a change. Early on, the script lays on the cliches: The men looking on in shock at TV news coverage of 9/11, the wives responding to their husband's call to duty, the children not understanding, and the promises to return home or else. The unique mission put the men on horseback, aiding the warlord on the ground while ordering tactical bombing from the air. Once the battles start, it's hard to tell the warring tribes apart. This probably relates to the true nature of the battle, but makes for difficult watching. Hemsworth channels his inner "Thor," actually sounding like the superhero as opposed to a devoted soldier. The actors' makeup looks fake. The movie runs long. I can't deny the heroism portrayed in "12 Strong," but I think they deserved a better movie. "12 Strong," 2 stars, rated "R." Does it deliver what it promises? Cliched war picture. Is it entertaining? Slow, long and poorly written. Is it worth the price of admission? "12 Strong" will have meaning for military fans, but little connection to most others.